“Hey, leave your message after………beeppppp….” when you hear this voice on your phone it’s an assurance that you are partially heard even though you are not heard. Just like that, there are tons of things that voice technology assures you in coming days. Thanks to some innovative minds and software developers who have drizzled their sheer intelligence on voice technology to make this possible. Amazon Echo, Google Assistant, Siri and Alexa they are all bot-sibling bringing a new revolution in voice technology. And people are getting accustomed to this new voice technology really fast, demanding to incorporate them in their cars, mobile apps, home appliances, remotes, doors, shower, closets, pen, paper and what not. Imagine a voice controlled car that drives you to the cinema hall, shopping mall or any events at your commands. Did I say Events? This is because if there is any Industry that will reap the maximum benefit of voice technology, then it is the Event Industry. It has myriad of applications for voice technology. Events are enormous. When visitors attend any event, they go frantic as they have to connect with so many things at a time. They feel like they are blindfolded and pushed into the puddle of events, leaving baffled and exhausted. Not knowing what is where and what to see first? One solution is to keep visitors felicitous throughout the event is to back events with an Event app. An app with voice over that puts visitors straight to the exhibition of their interest without wasting time shuffling into each and every stall. While attending any events, visitor have certain FAQ’s in mind like what is the product? How is it beneficial to them? Where to get it? And so on. If these FAQ’s are answered with standing kiosk having voice technology, it will help to brief visitors about the product as many times as they want. With advancement in artificial intelligence, IoT (Internet of Things), and voice technology there would be minimum involvement of humans to human interaction and more of Machine to human. Drones have already made headlines in events, capturing photos and live videos you could not have imagined. How drones along with voice technology will surreal this experience is still a topic of debate among bright minds. However, the basic application is foresighted in handling event security, especially where GPS don’t work. A human operator can patrol the pre-set path of the Events with voice commands and give direction to the drones accordingly. They will also identify any threat or strangers with malicious intention entered in the exhibition. Attendees take their valuable time from their busy schedule to attend events but are seen more occupied with food stall then events. Stepping over the crowd, juggling through the queue and making a way out with food-plate holding up like an Olympic torch are common visuals. Vending machines with voice command possibly could circumvent this problem, where food packs pop out at your command. It will not only help disperse the crowd but also save valuable time for events. Connecting with a community can optimize your business success, especially if you are in the Event Industry. We are just one step far to convert the mobile app into a voice recognition search engine that will connect you to your community instantly. An app which gives you details of all service providers as well as happening events in your cities and nearby just at a pitch of your voice. Though ‘Siri’ and ‘Alexa’ do these to a certain level, a discrete app for events could only add value to the networking bit. Standing kiosks are quite common in events these days for registering attendees. The self-registration process can be even speeded up with voice integrated kiosk, where attendees just have to stand in front of a kiosk and record their personal details. Just like registering visitors detail on the system with Voice, the same goes for getting feedback on the services. Visitors can give instant feedback on the event exhibitors as well as the product. They can rate the exhibitors and give their suggestion on further improvement. Stand-up scooter or Hoverboard controlled by voice over should be an add-on to an Event. The scooter can sync an event app through which attendees can scroll the event menu and hop around various events or exhibition without getting exhausted. It also has an inbuilt charger that will keep your phone charged. But not all attendees can leverage this service as practically not possible to provide scooter to each and every individual attending the event. Every individual is blessed with a unique voice. Search engines inducing voice recognition already, the further advancement in technology will not remain to search alone. The analytics will drift slowly from text-based to voice based. 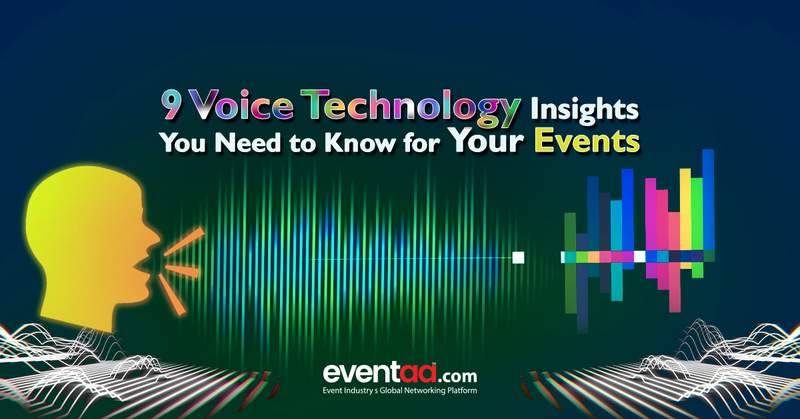 For events, you can estimate the number of visitors simply by tracking the voice analytics. This will help event planner to encounter the ambiguity remained with the event popularity. Anything that I have missed here? What mentioned above is an autonomy of voice technology for events. However, there are disconcert views over its practical implication, and it is possible that some of you have broad understanding of its application that might not explained in-depth over here or missed….